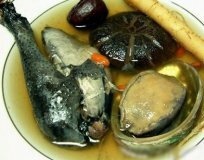 For many years, since the Tang dynasty, a special meal, 'maifengdanyao,' was thought to be a cure all for gyaenocological diseases. It was identified in the famous medical book written during the Ming Dynasty “Compendium of Materia Medica” as a tonic and nourishing food to treat women’s diseases. It enriches blood and builds up health. Taihe chicken is also favored as food. Its muscle fiber is fine and tender. Chicken soup made with it is tasty and refreshing. Its unique flavor makes it a special dish in a banquet. It could also make a precious medicinal dish when cooked with herbs. Tonifies blood and qi, warms the uterus, nurtures yin, resolves stagnation of liver qi and blood. Use for menstrual disorders due to deficiency or cold, including amenorrhea, dysmenorrhea, or infertility, pregnancy. Beneficial in post-partum fatigue. Effective for menstrual cramps and pre-menstrual syndrome due to blood deficiency, stagnation and congestion of liver qi. Also useful for habitual dry cough or dry skin. This is one of the four famous Chinese gift liquors. 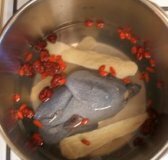 In the Taihe country brewery, black-bone chicken mixed with Chinese angelica, dangshen and 14 other traditional Chinese medicinal herbs are steeped in liquor for three to four months, then stored for six months. It takes ten months to make Taihe Wuji Bujiu. Black chicken contains 18 kinds of amino acids (including the 8 essential amino acids for the human body); vitamins B1, B2, B6, B12, C and E; niacin; protein; fat; calcium; phosphorus; iron; nicotinic acid; and more. Laboratory tests show that black chicken contains certain hormones, blue pigment and amino acids which are required by the human body. These factors can increase blood cells and haemoglobin.